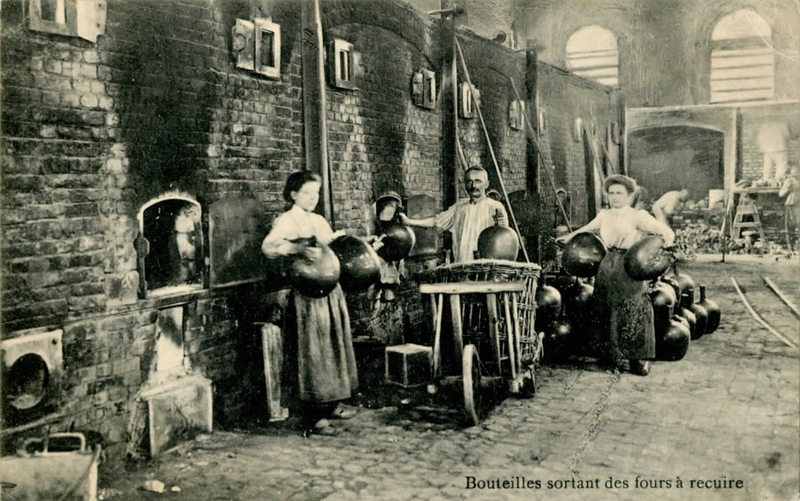 Image: Postcard with caption: Bouteilles sourtant des fours a recuire (bottles coming out of the annealing over) Verreies de Jumet (Jumet, Belgium), ca. 1910. (Photo: Wilmet, Momignies, Belgium). Rakow Library Chambon Collection. Hello! Thank you for your question. Women have played an important role in glassmaking, though their achievements have often been overshadowed. The Museum has many great online resources on women in glass. If you decide to focus on women studio artists and the challenges they faced, you may be interested in this episode of the podcast Glasscaster: Hot Glass Talk in a High-Tech World: "Sally Prasch, One Industrial-Strength Glass Artist!" from November 11, 2007: "One of a handful of female scientific glassblowers ..., [Sally Prasch's] story, struggle and subsequent success in this field makes great listening." Skinner, Orin E. “Women in stained glass.” Stained Glass 35 (Winter 1940): 113-23, and Stained Glass 36 (Spring 1941): 18-25. Notes: 30 American and European women. If you wish to borrow copies of library items, please contact your local library. The Rakow Research Library will lend designated books from its collection and will send copies of articles requested by other libraries. Your library can request items through the OCLC WorldShare Interlibrary Loan (ILL) system or by direct request through email at ill@cmog.org. For more information, please see our ILL policies and procedures. Please do not hesitate to contact us in the future with your glass-related questions! Who were the key female glass artists in the earliest days of the studio glass movement (in the US and internationally). How were women employed in the glass making business in the 16th and 17th centuries?